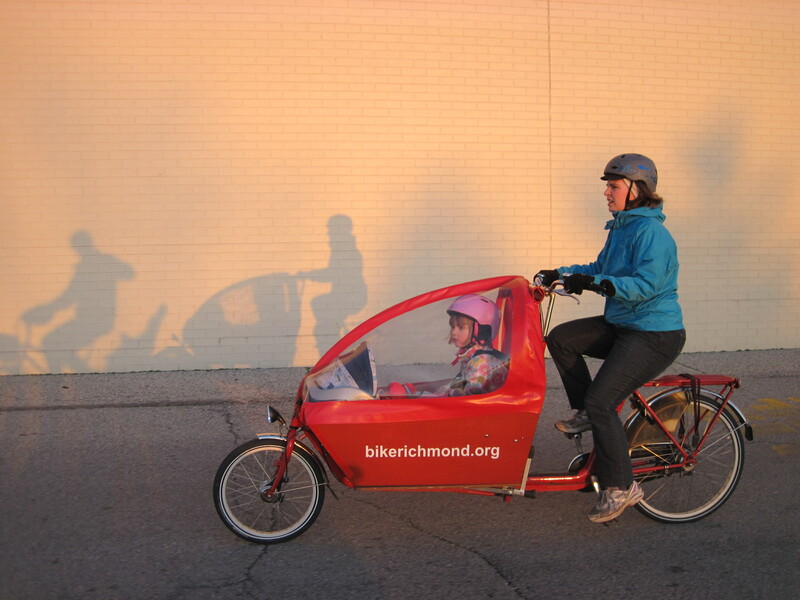 Tonight my wife rode our two kids out to dinner in the bakfiets. The 9 month old baby rides in a rear-facing car seat, while the 4 year old sits on the bench seat. The target restaurant was in a mall parking lot off a busy road, about 3 miles away. However, with a bit of research and experimentation, we found a back way into the mall that is only a bit further and is much lower traffic. We even got to see a rabbit! I rode along on our electric Yuba Mundo with the requisite parenting gear. The trip was a great way to combine some exercise, family time and transportation. I’m blessed that both my young children enjoy bicycling. My four year old daughter now rides her own bike on 3 to 4 mile trips on sidewalks and trails. The 10-month old simply enjoys the experience… and the naps. My daughter’s behavior is mysteriously good on her bike outings. Just as video games can foster addiction by providing a series of small successes, I think sidewalk-biking is also working to build confidence and self-esteem. At each block or alley, she successfully stops, checks traffic, and waits for the signal to go- she’s “cleared a level”. There’s also encouragement for good hill climbing and careful braking when going down hill. On this day, we found ourselves returning home at dusk with a large red sun on the horizon. and captured the photos above and below.